Before the start of the Flux Factory's Death Match, Arts Funding: Follow the $$$$, one of the many affiliated programs for No Longer Empty's (NLE) current exhibition, guests mingle with plastic cups of red wine and Crisp beers in their hands. 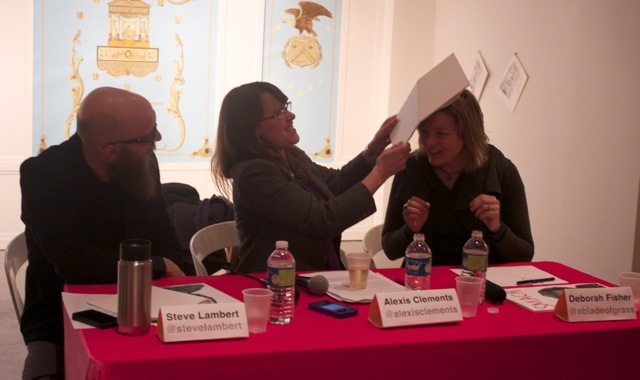 The panelists, Steve Lambert, co-founder of the Center for Creative Activism; Alexis Clements, current fellow at the Cultural Strategies Initiative; and Deborah Fisher, executive director of A Blade of Grass, interact casually with each other before the debate begins. In the background Coolio's Money (Dollar Bill Y'all) plays as a projector flashes photos from the 1980s culture wars, along with other relatable imagery. I first learned about NLE through a review of its last exhibition This Side of Paradise in the Bronx. It was there that I sat on a patch of grass with executive director Naomi Hersson-Ringskog learning about NLE's unique process that fuses curatorial practice, cultural tourism and community engagement. This past December, NLE celebrated the opening of its 14th site-specific exhibition, How Much Do I Owe You?, with shoulder-to-shoulder attendance and an acoustic jazz band playing from a platform overlooking the crowd. Displayed throughout the three levels of the once Chase Manhattan Bank building, the space with its unlocked vaults and unexpected passageways, echoes the themes of currency, value and exchange from an unassuming perspective -- the artist's. On my first visit to the Clock Tower in Long Island City, Queens, the exhibition was still in its installation phase with sporadic elements of each artists' work spread out on the floors and tucked in side alcoves shooting off from the central nave of the buildings cathedral-like entrance. 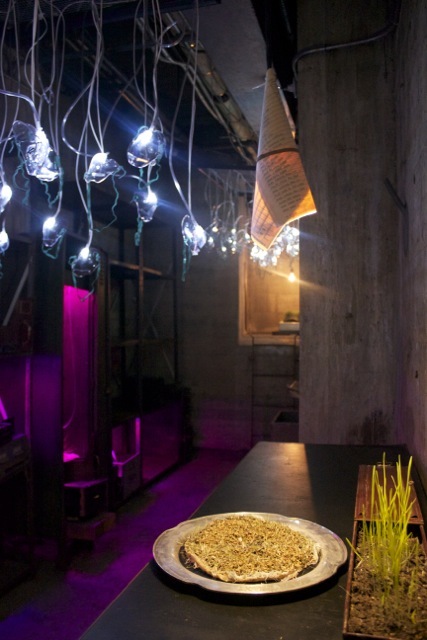 Communications manager Lucy Lydon was kind enough to give me a tour of the space, highlighting installations like Hayoon Jay Lee's Shifting Landscape -- a swirling landscape of rice grains illuminated from underneath by a strand of light. The show also includes some interactive pieces like Jennifer Dalton's Reckoning. 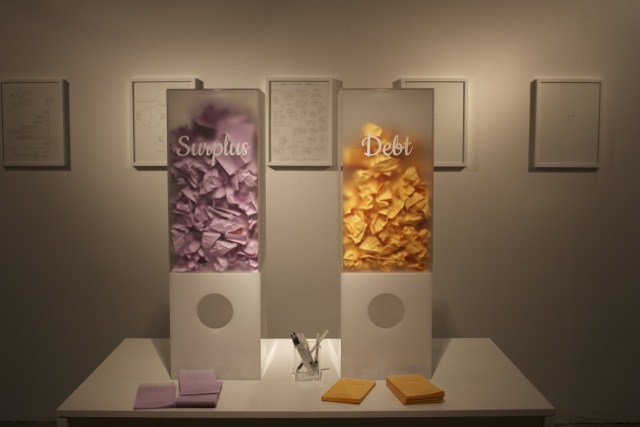 For this installation, visitors are invited to consider notions of "Surplus" and "Debt" as they relate to everyday experiences by filling out surveys identifying where we've given more than we've received and vice versa. In exchange, participants can take a pin identifying either experience. Mine said, "Chump." Another interactive piece, Mel Chin's installation of the ongoing Operation Paydirt project, began in New Orleans in 2008 after Hurricane Katrina and is geared toward the prevention of lead (Pb) poising among children. In this piece, guests can contribute to the project by designing their own "Fundred" Dollar Bills and depositing them in the F.R.E.E (Fundred Reserve Even Exchange) Bank -- the safe house for this symbolic, public currency that will be presented to Congress in exchange for real funding to eradicate lead poisoning. 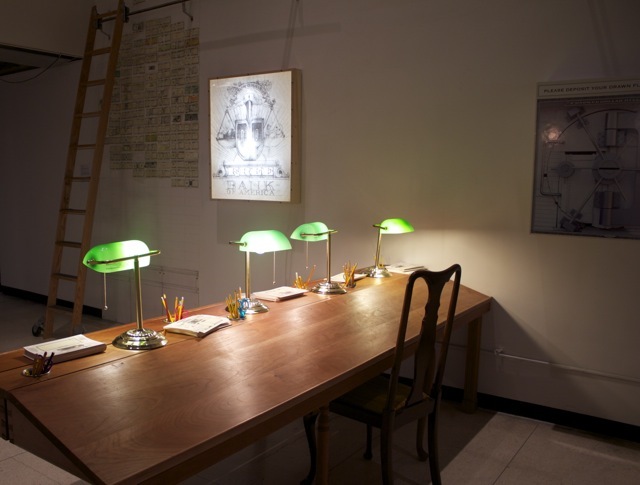 The "Drawing Station" includes green glass shade lamps reminiscent of an old bank house and in keeping with the history of the building, dating back to 1927 and dubbed the first skyscraper in Queens. Mel Chin, Pilot Branch of the F.R.E.E. (Fundred Reserve Even Exchange) Bank of America, L.I.C. The debate was broken down into two rounds, each framed by questions pertaining to arts funding and, incidentally, themes floating around the exhibition. Each panelist is given a limited amount of time to respond before a flood of sounds and a portable fog machine drowns them out. At any given time, another panelist can lay a "smack down" card on the responding panelist, should he or she feel so moved to interrupt with an opposing statement. The audience is also given the opportunity to "smack down" a panelist in each round. When Alexis Clements criticized the commitment of Kickstarter campaigners, stating the rarity of completed projects sponsored through the online fundraising platform, a voice from the crowd yells, "Smack that sh*t down! ", and the crowd cheers and laughs collectively. Despite her willingness to upset the crowd and stir up trouble, many of Clements' comments rang true with the audience and provoked many head nods, my own included. Among her valid points, Clements illuminated the inequitable distribution of arts funding to women and people and communities of color in the United States -- facts that have been astutely exposed in Holly Sidford's recent report, Fusing Arts, Culture and Social Change: High Impact Strategies for Philanthropy. In it, Sidford explains that of the 11 percent of annual foundation giving for arts and culture nonprofits, more than half is awarded to organizations with budgets of more than $5 million (2 percent of arts nonprofits), leaving just 10 percent for those nonprofits that strengthen and engage communities of color, and 4 percent for organizations focusing on social justice work. Fisher was able to offer her own perspectives, from the position of the funder, representing A Blade of Grass, a nonprofit that supports individual artists and small nonprofits engaging with social justice issues. To the many questions posed that critiqued the origin of money funding the arts (i.e., Wall Street), Fisher preached that perhaps what matters more is how the money is used once it's awarded to the arts organizations and artists. Although this may be true, accepting funding from just anywhere could prove to be problematic if the giver's reputation and behavior contradicts and even dismantles the mission of the receiver. In the midst of this discussion, Lambert made the point that anything that's important enough can be done with little or no money, to which an audience member shouted, "But is that sustainable?" Although Death Match puts a clever and quirky spin on a bitter subject, the reality is individual artists and arts organizations have shifted into crisis gear, as we all run our soup bowls along the bottom of the barrel. Aside from inequitable distribution on the part of philanthropic institutions, arts funding allocations on the state, local and federal levels (with the exception of the National Endowment for the Arts (NEA) have continued to decline significantly over the past four years. Local government arts funding has fallen 18 percent since 2008 while funding from the state has decreased 27 percent within the same time span. Both figures are comparable to arts funding allocations of the late '90s (Grantmakers in the Arts, Public Funding for the Arts: 2012 Update). Meanwhile, arts and cultural groups are forced to think creatively about fund-raising and access to diverse streams of revenue. "Foundation funding is getting better as we have a longer track record of successful projects," says NLE founder, president and chief curator, Manon Slome. "But corporate [is] getting very hard as they scale back giving." Perhaps it's not just the creative success that strengthens their reputability as a fundable arts nonprofit (I've seen their 990 and trust me, they are, in fact a real nonprofit! ), but also the collective disposition of their staff from the executives to the interns. In a time when arts and culture are often mistakenly discounted as secondary to basic human needs, it certainly can't hurt to have a team of accessible people who curate spaces and opportunities to engage with contemporary art within a given community.